Rosette vent for the second-floor courtroom as seen from the attic. Woodstock City Planner Nancy Baker led an informal tour of the Old Courthouse on the Woodstock Square the evening of Dec. 3 for members of the McHenry County Historic Preservation Commission and guests. 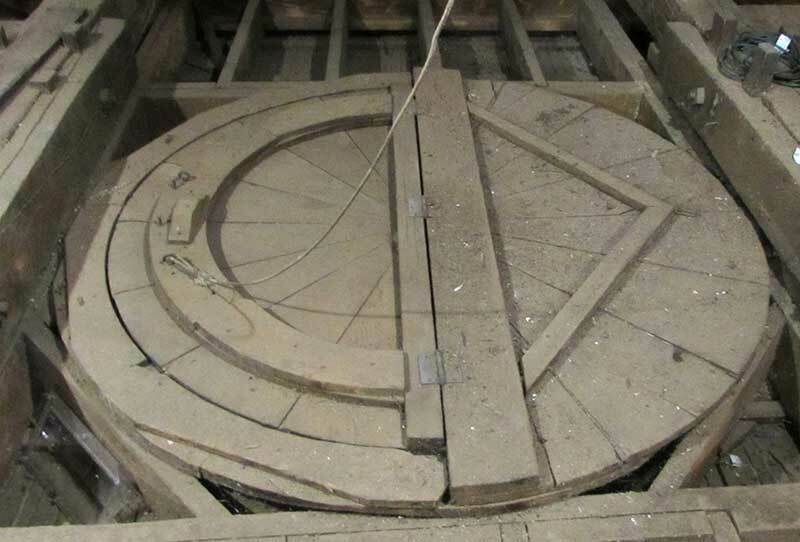 Renovations include repairs to the roof and cupola, opening of a doorway in the north gallery (formerly the county clerk’s office), the removal of carpet and rubber treads on the spiral staircase leading to the second floor, removal of the front steps and structural masonry work. A study released in 2012 detailed $143,000 in immediate, critical needs in the building. The dome and cupola restoration is part of a $4.7-million plan to repair the former county courthouse and sheriff's house. Pictured below (from left) are Baker, historican Craig Pfannkuche, commission member Shawn Phillips and his wife, Paola.